We’re going to be talking about the book. 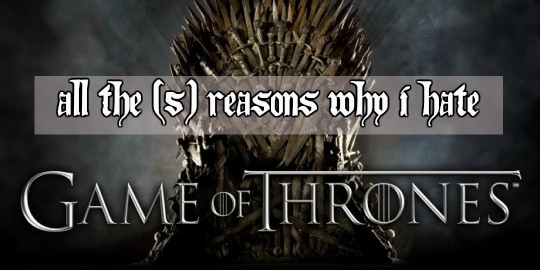 I’ve read Game of Thrones but have not seen the show and don’t even plan to- and here you’ll be finding out why. Game of Thrones is extremely long. There are several chapters, each chapter with lots of details, characters and environment descriptions. As a result, the book is very long, the series is very long. It would take me several months to get through another book and at the end, I wouldn’t even remember what had happened. There are too many characters. Which is not surprising, considering this is a fantasy about fighting for the throne of a kingdom. Of course there are going to lots of contenders, each with their own history and members. But to be honest, I can’t keep up with all these people. It’s really nice that there’s so much detail but… I can’t go through all of this. Everyone is dying. Whoever I root for is dying. At first I thought it was just my choices that made people die but then I realized that the author just really likes killing characters off. Apart from that, things just seem to be constantly going down hill. The entire story looks like a spiraling vortex of darkness, violence and hopelessness. The plot is extremely complex. Some chapters follow this character, some chapters follow the other character. Sometimes you’re really invested in one character and then you end up having to go through several chapters before that character is back again. By the time you get there, you’d probably forget where you left them off at in the first place. So the book tends to get a little disjointed sometimes. I just can’t bring myself to continue reading the series or to start watching the show. It’s just one of those things that I think wouldn’t agree with me at all. I wouldn’t be comfortable reading it (it would feel an awful lot like homework, having to concentrate to what’s happening- Game of Thrones is not leisure reading) and I most certainly would not be comfortable watching it either- alone or with someone else. Have you read or seen Game of Thrones? What are your opinions about it?